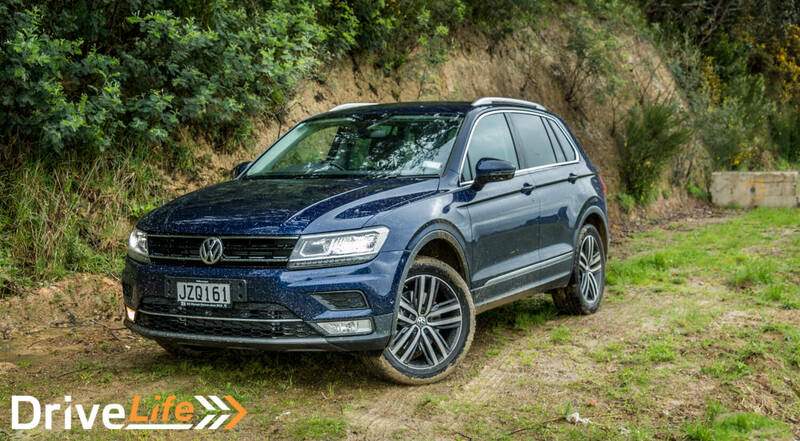 2016 VW Tiguan – Car Review – Urban off-roader? 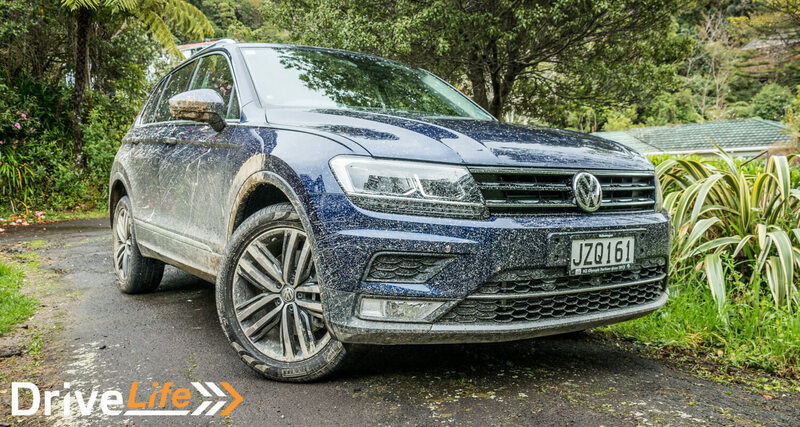 The second generation Volkswagen Tiguan has just been launched in New Zealand. It’s bigger all round than its predecessor, and features lots of smart technology. 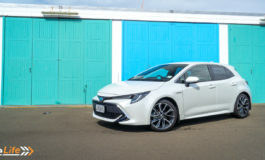 It has just been shortlisted for the 2016 New Zealand AA car of the Year. 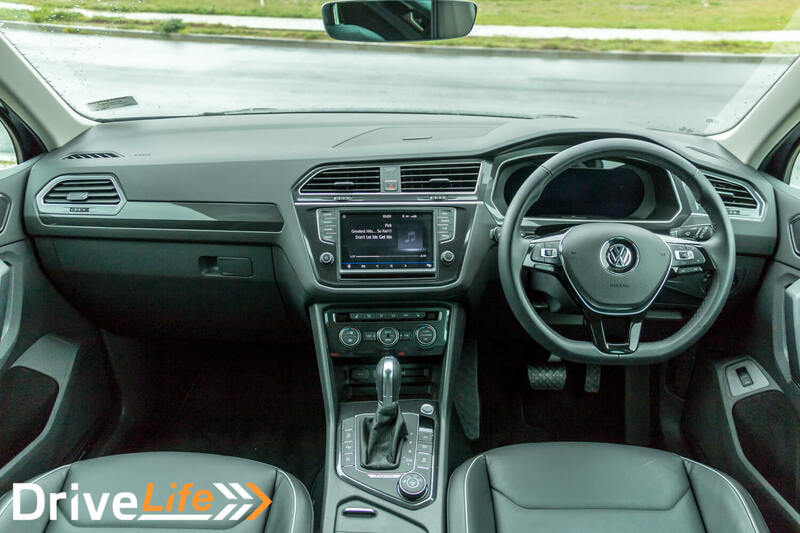 It’s available in two spec levels in two wheel drive, both with the 110kW 1.4 TSI petrol engine. The 4Motion four wheel drive version can be specced with either the 132kW 2.0l turbo petrol, 110kW 2.0l turbodiesel, or if you go for the R Line you’ll get the 162kW 2.0l turbo petrol. The standard spec across the range is impressive: regenerative braking and start/stop, Electronic Stability Control with driver steering recommendation, ABS, ASR (Stability control), EDL (electronic diff lock), EDTC (engine drag torque control), and trailer stabilisation, front, side, knee and curtain airbags, fatigue detection system, Lane Keep Assist and Rear Traffic Alert, auto lights and wipers, cornering lights, park assist (auto parking) – the list goes on. We tested the TSI Highline 4Motion, which came in Atlantic Blue metallic, one of 12 available colours, which are mostly muted greys and browns, but do include orange, red and a bright blue. The Tiguan is instantly recognisable as a Volkswagen, with a similar nose to the new Passat and Golf. The proportions are pleasing to the eye, but at first it doesn’t really stand out much among the other SUVs. Look at it more and the details start to reveal themselves, with chrome detailing and sharp creases combining to make it look pretty smart. As often happens, it grew on me the more I took in its details and external features. The inside of the Tiguan is very pleasant. The leather seats are comfortable, with a decent amount of side support. The driver gets electric seat adjustment with three memories, the passenger seat is manually adjusted. The steering wheel adjusts manually in four directions. There’s ambient lighting in the footwells and a storage tray under the passenger seat. Both front seats are three-stage heated. 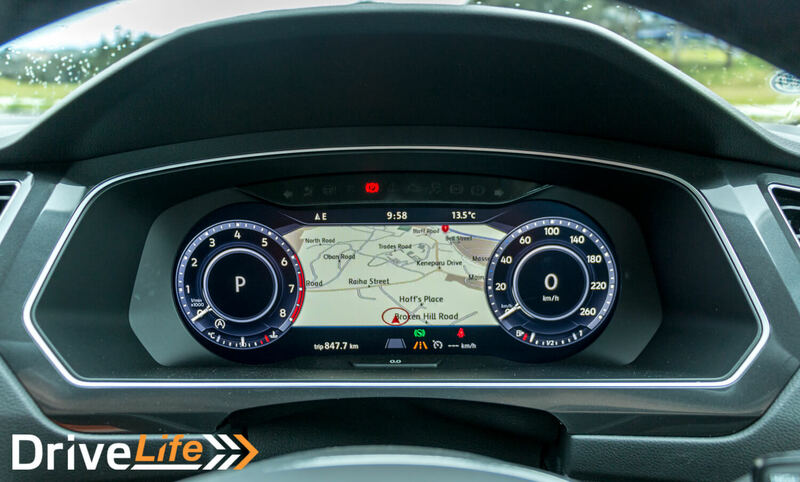 The instrument cluster is fully digital, like the one in the new Audi TT. Its default setting has an analogue-style rev counter on the left and speedo on the right. It’s bright and clear with great contrast, and movement is very smooth. So much so it’s easy to forget you’re looking at a screen. The display can be configured in many ways, with different gauge styles, and information in the centre section. Switch to the nav view and the gauges shrink to the sides, giving you a large colour map across a big chunk of the display. It’s all very slick and well presented. There’s a central 8” touchscreen for the stereo and media system, as well as the all-round camera system. There are physical buttons for the main functions, and knobs for the volume and track, which I like, as well as buttons on the steering wheel for stereo, phone, cruise control and for setting the display options. It sounds like a lot of buttons but it’s all intuitive to use. The 8 speaker stereo is good, but not great. It does start to lose clarity at higher volumes. There’s a $1500 upgrade option available which adds a subwoofer and 10 channel amplifier. The central screen can be configured to show a multitude of different information screens – off-road mode with compass and angle meters, performance monitor with G and power meters, even a Think Blue trainer to improve your eco driving. It was it odd that you could not use the map on the central screen if you had it on the main dash too. It would have been nice to be able to move the map around via the central screen even if it was just a GUI for the one on the dash. But it was one or the other, and it was hard to move or edit or pick a destination on the dash map. 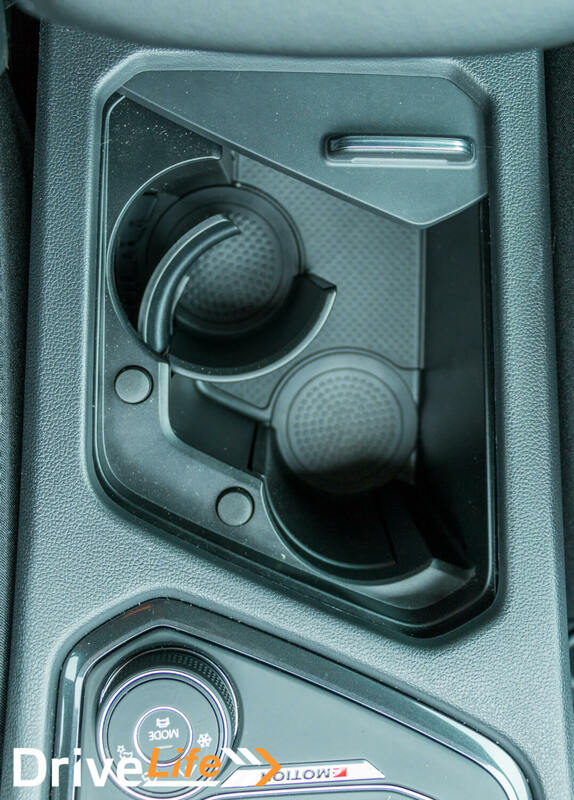 I really liked the cup holders in the recess in the centre console which pop out when a small button is pressed, but can be folded away if you want to store larger items. Rear passengers get aeroplane-style fold-up trays with a pop-out cupholder on the side. There’s lots of rear legroom, and the angle of the seatbacks can be changed and they can be slid forward. Rear passengers also get their own set of temperature controls in the Tiguan’s three-zone climate control system. The tailgate is electrically operated, either from the key, a button in the front, or on the tailgate itself. The boot is a pretty huge 615 litres with the seats up, and has plenty of useful cubbies, hooks and latches to tie down your cargo, as well as another power socket. 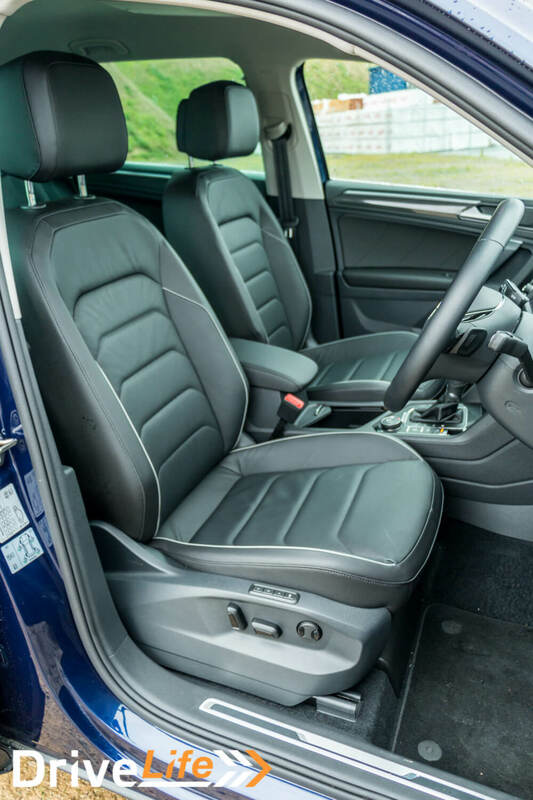 The rear seat splits 40/20/40 giving plenty of loading flexibility, and a huge space when it’s completely folded. The Tiguan has keyless entry and start, and an electronic parking brake. There’s an auto hold function which applies the parking brake when you’re stopped at junctions or on hills, automatically releasing it when you press the throttle. This works well and means you don’t have to sit with your foot on the brake, dazzling the driver behind with your lights. Park Assist is included throughout the range. The Tiguan will park itself, in both parallel and perpendicular spaces. It’s a bit fiddly to use until you get used to it, but once you do it works well. Push the button, drive along until the car detects a suitable space. Select it on the display and follow the on-screen instructions. 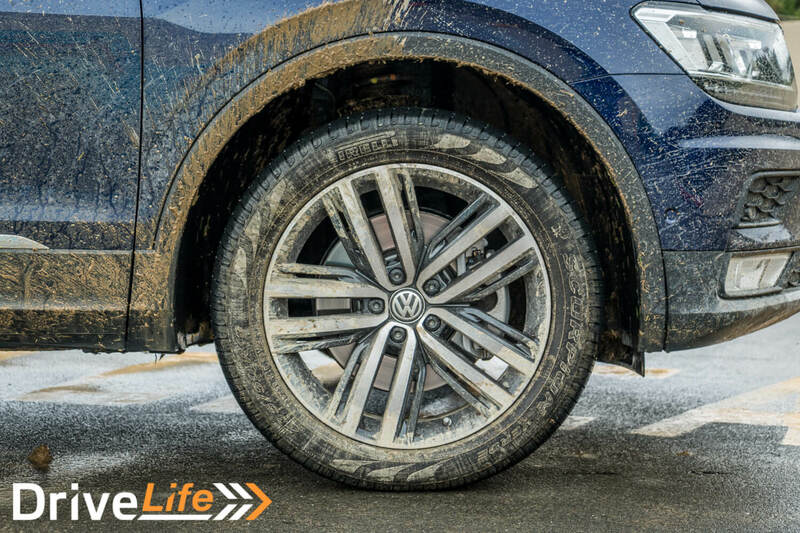 The driver controls the brake, accelerator and forward/reverse shifting and the Tiguan does the rest for you. In traffic, the Tiguan is a relaxing place to be. The radar cruise will maintain your chosen following distance, coming to a complete stop if necessary, needing just a tap of the throttle to set off again. The set speed and road speed are shown on the heads-up display on the windscreen and it’s easy to set the speed you require. Lane Keep Assist nudges the wheel slightly if you happen to drift too far from the centre of your lane, which can be a bit disconcerting at first. It’s very quiet, with the main sound being wind noise at most speeds. Even with the 235-profile 19” Pirelli tyres fitted to our test car there was hardly any tyre noise. This adds to the feeling of comfort and luxury, this would be a great car to take on long journeys. But it’s not all about cruising along in traffic. What happens if you want to have some fun? I took the Tiguan to one of my favourite twisty roads, and I was really impressed by how well it performed. It seems to handle and corner way better than it should for a taller vehicle. The steering is direct and well-weighted at speed, and the engine makes a lovely growl when pressing on, with a just-audible turbo whistle. It’s no slouch either, 0-100kph in 7.7 seconds, and in-gear acceleration is good with that 132kW 2.0l turbo engine. The 7-speed DSG transmission is excellent, with lightning-fast shifts. In normal driving it’s barely noticeable, but put the transmission in Sport mode and it holds the gears up to the redline, or until you shift with the paddles behind the steering wheel. As you can see from the photos I also took the Tiguan a little bit off-road. 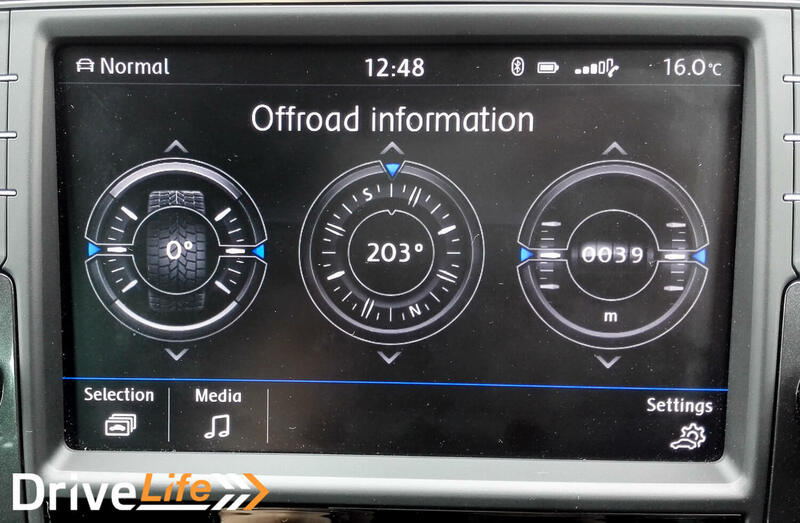 There’s a dial to select the driving mode – On-Road, Off-Road, Snow and Individual. I put it into Off-Road mode and drove along some gravel road, followed by big puddles, deep mud and a few ruts. At one point I thought I was about to get stuck, but the 4WD system just pulled the Tiguan out of the boggy ruts. I may have also done some low-speed powerslides across a muddy field, compromising the cameras under the mirrors somewhat! The Tiguan felt composed and confident at all times, and feels like it could get out of just about any situation you might get it into in normal use. The Tiguan is a great family all-rounder. It has the high SUV driving position and presence that people are looking for, but it’s fun to drive. It’s spacious and comfortable with lots of safety technology and good equipment levels. It can even cope off-road. It certainly deserves that car of the year nomination.